AME Group, a leading prototype manufacturer that is based in Dinnington, Rotherham, has highlighted the role of good design in healthcare - an industry driven by innovation. The growing company combines a team of creative designers and technical designers who work on new products and create high-specification prototypes using 3D printing technology for customers including Dyson, GlaxoSmithKline, Hornby, Morphy Richards and Unilever. The business was founded in 1997 after managing director Ian Jones - a mechanical engineering graduate, who cut his teeth working at the Selby coalfield - was made redundant from his job with British Coal. It is now based on the site of the former Dinnington Colliery. In the company's "Gamechanger" publication, Tim Stern, design manager at AME Group, said: "In order to relieve the strain on hospitals and doctors' surgeries, patients will be increasingly relied on to use remote diagnostic and monitoring devices. This raises some big issues for the designers of medical devices. "The increased reliance on patients to use equipment means that products will need to have an intuitive design that is easy to use. Devices will also need to deliver quick results that are easy to interpret. "As the medical space becomes more crowded, hardware and user interface design will become key differentiators, with buyers more likely to factor user experience into their purchasing decisions." One such product that AME group has worked on is MicroBioSensor (pictured, below) - supporting the University of Manchester spinout company to develop potential applications for its detection chemistries into commercially viable products. A number of prototypes were developed to address the problem of medical device use actually increasing risks of patients contracting an infection. The outcome is an early warning device that, with a simple change of colour, identifies an escalating infection and the appropriate treatment. The device fights multi-drug resistance by improving the management of effective antibiotic drugs, facilitating care away from hospitals and reducing pressure on the healthcare system. Another product where the focus is on the user is RapidRhythm (pictured, top), which could soon reduce heart screening times by over 80%. 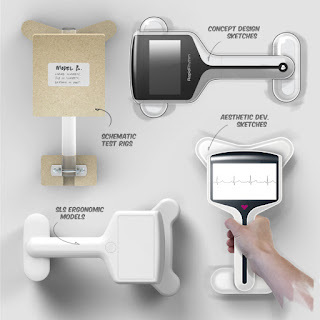 User-centric design from AME Group has helped to develop a wireless handheld device that allows heart patients to be screened in just 90 seconds. The current screening method is an electrocardiogram (ECG) test, a procedure that takes up to 20 minutes. RapidRhythm requires less training than traditional ECG and provides fewer failed readings. The product was engineered in 3D CAD, with a number of test prototypes created using AME's in-house facilities. This enabled engineers to assess the design, highlight issues and minimise the risk and potential costs of resolving them at a later date. AME's low volume production facilities will be used to manufacture a small quantity of the devices, which will be used to validate the Rapid Rhythm product in the field.